R406 is a potent Syk inhibitor with IC50 of 41 nM in cell-free assays, strongly inhibits Syk but not Lyn, 5-fold less potent to Flt3. Phase 1. Platelets (3 x 108/mL) were preincubated with Y27632 (10 uM), R406 (1 uM), or a combination of Y27632 and R406 for 20 minutes followed by stimulation with oxLDL (50 ug/mL) for 15 seconds and lysis. Samples were then separated by SDS-PAGE and were immunoblotted for phospho-MLCSer19, followed by reprobing for β-tubulin. (Fi) Representative blots. (Fii) Densitometric analysis of 3 independent experiments. *P < .05. Data are presented as mean ± SEM. Experiments were carried out in the presence of apyrase (2 U/mL), indomethacin (10 uM), and EGTA (1 mM). R788 (Fostamatinib) disodium, a prodrug of the active metabolite R406, is a Syk inhibitor with IC50 of 41 nM in a cell-free assay, strongly inhibits Syk but not Lyn, 5-fold less potent to Flt3. Phase 3. BCWM.1 and MWCL-1 cells treated with either vehicle or fostamatinib at the indicated concentrations for two hours, then protein extracts were analyzed by Western blotting for the activation status of MEK, p44/42 MAPK, and Akt with phospho-specific antibodies. R406 (free base) is a potent Syk inhibitor with IC50 of 41 nM in a cell-free assay, strongly inhibits Syk but not Lyn, 5-fold less potent to Flt3. Phase 1. (C) Z-138 and JEKO-1 cells were simultaneously exposed to sorafenib and R406 at the indicated doses, and cell viability was determined at 48 hours by annexin V/PI staining. Bars represent the mean ± SD of 3 independent experiments. CI value is indicated for each combination. (D) Primary MCL cells from 7 patients were simultaneously exposed to sorafenib and R406 at the indicated doses for 48 hours, and cell viability was determined as above. Bars represent the mean ± SEM of all the samples analyzed. CI value is indicated for each combination. PRT062607 (P505-15, BIIB057) HCl is a novel, highly selective Syk inhibitor with IC50 of 1 nM in cell-free assays, >80-fold selective for Syk than Fgr, Lyn, FAK, Pyk2 and Zap70. Ptpn6fl/fl and Inpp5dfl/fl ALL cells carrying 4-OHT-inducible Cre (Cre) or an empty vector were pre-treated with PRT062607 (2.5 µmol/L) for 2 days. Deletion of Ptpn6 (i) or Inpp5d (j) was induced by addition of 4-OHT and relative changes of GFP1 cells were monitored by flow cytometry. Fostamatinib (R788), a prodrug of the active metabolite R406, is a Syk inhibitor with IC50 of 41 nM, strongly inhibits Syk but not Lyn, 5-fold less potent to Flt3. Phase 3. B cells were stimulated by irradiated CD40L+ L cells. Forward scatter vs. BrdU incorporation analysis (day 5) in the gated CD19+ CLL cells (D). The distribution of cells with high FSC (blasts, right quadrants) and proliferation (BrdU+, upper quadrants) are shown. Piceatannol, a natural stilbene, is a selective Syk inhibitor and ~10-fold selectivity versus Lyn. Influence of piceatannol and resveratrol on hydrogen peroxide production by human subcutaneous fat tissue. H202 release was monitored on a 30-min period without any added agent, except the chromogenic mixture (basal), or with NADPH oxidase inhibitor (apocynin 10 μM, shaded column), each stilbene at 1 mM, or MAO and SSAO inhibitors (pargyline plus semicarbazide at 1 mM: parg + semi, dotted column). Each column is the mean ± SEM of 16 homogenates from obese patients. Different from basal hydrogen peroxide production at: **P < 0.01. RO9021 potently inhibits SYK kinase activity with an average IC50 of 5.6 nM and suppresses B-cell receptor signaling. TAK-659 is a potent and selective inhibitor of spleen tyrosine kinase (SYK) with an IC50 value of 3.2 nM. 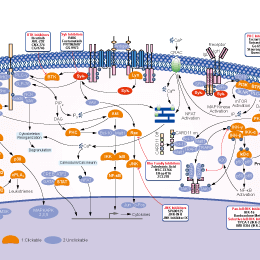 It is selective against most other kinases, but potent toward both SYK and FLT3. PRT-060318 (PRT318) is a novel selective inhibitor of the Syk tyrosine kinase with an IC50 of 4 nM, as an approach to HIT treatment. Entospletinib (GS-9973) is an orally bioavailable, selective Syk inhibitor with IC50 of 7.7 nM in a cell-free assay and showed 13- to >1000-fold cellular selectivity for Syk over other kinases(including Jak2, ckit, Flt3, Ret, KDR) as assessed by target protein phosphorylation or functional response. (B) SYK(pY352) and PLCγ2(pY759) in CVID patients' CD21low B cells untreated (filled circles), in the presence of Entospletinib (open circle), or after washout of the inhibitor (gray circles) (n = 5). BAY-61-3606 is a potent and selective inhibitor of Syk kinase (Ki = 7.5 nM).